For other uses, see Philadelphia Experiment (disambiguation). 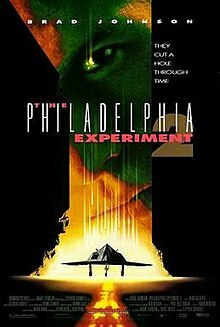 Philadelphia Experiment II (also known as Philadelphia Experiment 2) is a 1993 science fiction film. It is the sequel to the 1984 film The Philadelphia Experiment, but has none of the same cast or crew and only two of the same characters. It stars Brad Johnson as David Herdeg (the hero from the first film) and Gerrit Graham in a dual role as both the main villain and his father. It is nine years after the events of the first movie, and David Herdeg (the survivor of the Philadelphia Experiment), having since settled down with Allison (the woman from 1984) is living alone with his son, Ben, following Allison's death. His business is slowly failing, Ben's school attendance has dropped and the banks are threatening to foreclose on his house; however, he refuses financial help from Professor Longstreet, the original project director, in exchange for rejoining the U.S. Navy. In addition to this, he has also been having painful experiences which Longstreet rationalizes as stress-related hallucinations. Unbeknownst to Herdeg, however, Longstreet has been doing some research of his own. In a demonstration, engineer William Mailer (son of Friedrich Mahler, a Nazi scientist who worked on a project similar to the Philadelphia Experiment) uses the technology as a demonstration for a potential teleportation attack-defense strategy. The concept was to "beam" a bomber into a high-risk area to surprise enemy air defenses, attack and escape before they could react. To demonstrate, he beams a model aircraft from one end of the room to another. Despite getting significant interest, Longstreet manages to convince the panel that the technology is too dangerous to use. It is then revealed that Longstreet himself gave Mailer the necessary equipment - on condition that they be used only for test purposes. It is these tests that David is experiencing. Herdeg, meanwhile, is furious to learn that Longstreet has lied to him, and packs to leave California, hoping to get far enough away from the experiment. Meanwhile, Mailer, on the clock to vindicate his work, attempts to use the technology on a stealth F-117 Nighthawk they were using as part of the demonstration. The Nighthawk disappears, and David finds himself in agony as the world around him changes and his son disappears. David finds himself on the run from armed forces and is rescued by Jess, a member of an underground resistance group, who explains that Nazi Germany won World War II and is about to mark 60 years of the Nazi Party. America is under Nazi rule, with Jews, African-Americans, and other ethnic minorities being sent to concentration camps and its citizens suffering under an oppressive puppet government. David is horrified to learn that his son no longer exists. In this alternative timeline, Germany won the war because it had a futuristic aircraft called the Phoenix, to deliver atomic bombs, destroying Washington, D.C., and other major targets on the east coast. The United States, England, the Soviet Union, and other Allied nations became demoralized and eventually surrendered to Nazi Germany. The Phoenix was destroyed in the explosion and Friedrich Mahler, the scientist who took credit for building it, was ridiculed since he was unable to reproduce "his" successful design. The aircraft was, in fact, the same F-117 from Mailer's experiment, accidentally sent back in time. The first test of the device was to transport an F-117 with a payload of nuclear weapons to Ramstein Air Base in Germany. While the aircraft was successfully teleported to Ramstein, it was also transferred through time, arriving in 1943 Nazi Germany (the US pilot's fate is unknown). Mahler finds it and tells the Nazis that it is his invention. Because of Herdeg's unique blood, he is recruited by Longstreet - the leader of the rebels in this timeline - to go back and prevent the alteration to the timeline. During an attack on the base, their commander, Mailer, seemingly joins their side - however it is a ruse to go through back in time and warn his father about what will happen during the initial bombing and how to avert it, and he betrays them, leaving them to be ambushed by Nazi forces as he opens a portal for himself. Herdeg follows him through the portal as the other rebels, Jess included, sacrifice themselves to buy him time. Herdeg is warped back to the night before the F-117 (now repainted in Luftwaffe colors) launches to attack Washington and successfully destroys the aircraft. However, Mailer attacks him from behind and tries to kill him as he is leaving in revenge for ruining his plans. Herdeg shoots and kills Mahler and his son, Mailer, is erased from the timeline. Since he was never born, the grandfather paradox erases the aircraft teleportation project from existence and restores the timeline to normal. Herdeg travels back through the time portal and picks up his son at a baseball game - and waves to a now-alive but bemused Jess. At a crucial moment in 1943 Germany, Mailer has a conversation in German—without subtitles—with Mahler. Mailer tries to explain, in faltering German, that he is Mahler's son and that he needs to tell him what happened to the aircraft during the bombing run. Mahler responds in German that he has no son. Once Mahler is shot and killed, Mailer ceases to exist. This page was last edited on 24 February 2019, at 04:25 (UTC).